Pumpkins only mature fully on the vine. Harvest the fruits once they reach their full color to get the best looking pumpkins and ensure they can be stored for the longest time possible. Early and mid-fall is pumpkin season, with most varieties reaching full maturity during this time. 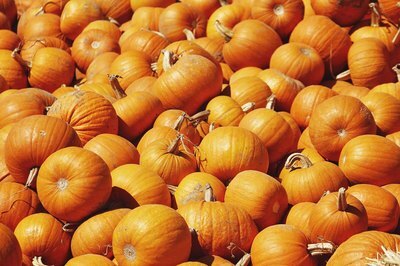 Picking your pumpkins fully ripe is only one part of successful pumpkin storage. Cleaning the pumpkins properly prevents fungal and bacterial growth and further extends their shelf life. Wear gloves. Combine 1 part household bleach with 9 parts of water. Soak a clean cloth in the bleach solution. Wipe down the outer surface of the pumpkin with a second cloth that is moistened with warm water. Remove any soil or dirt on the pumpkin shell, and wipe the pumpkin dry. Wring out the bleach-soaked cloth. 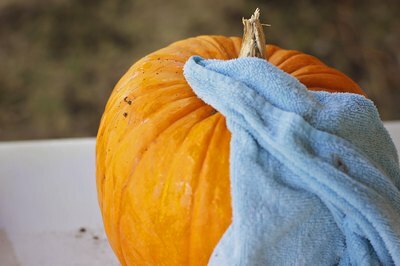 Wipe the entire surface of the pumpkin with the cloth, rewetting the cloth as necessary as you wipe. 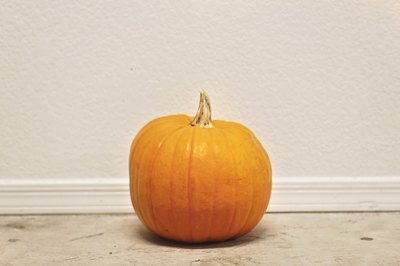 Cure the pumpkin in an 80- to 85-degree-Fahrenheit location for 10 days. The higher temperature during this brief storage time helps the pumpkin heal over any scratches or wounds on the shell caused during harvest. When Is the Best Time to Harvest Your Pumpkins?